The Benvenuti family has been making wine for as long as they can remember. It’s part of their tradition, and traditions of the Istria region. They are thankful for the knowledge their ancestors have passed on to them, who planted vineyards here in the first decades of the last century. This is confirmed by artifacts found in their vineyards, such as the clay jug from the Roman period. This artifact is now in a museum in Trieste, and for the Benvenuti family it’s a daily reminder of the wine history in this region and a motivator to continue to make great wines from three indigenous varieties – Istrian Malvasia, Teran and Muscat. Benvenuti own vineyards in several locations which are characterized by a specific micro climate. It’s a result of the influence of Adriatic Sea winds that comes through the valley of the river Mirna and accumulates in this area. The specificity of conditions in particular stand out the vineyards at the site of San Salvatore, site of the former village Kaldir. At 350 to 400 meters above sea level, this is the position of the south-west, terraced vineyards which are protected from the wind. The white soil gives the minerality to the grapes which grow in this area. Vineyard San Salvatore is the heart of indigenous varieties which, among other locations bonds us to nature. They practice sustainable farming and restrict production to around 100,000 bottles per year, an amount that allows superior quality and author’s signature – without compromise. The Benvenuti’s strive to craft wines of great structure, fruitiness and distinct varietal characteristics, with inevitable minerality, the base of each of our wines. Father Livio, and sons Nikola and Albert together hand harvest and craft each bottle. 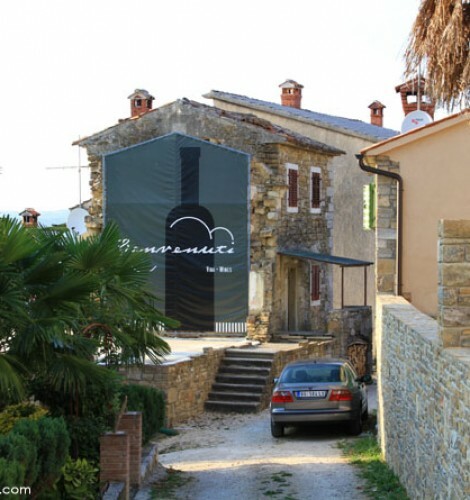 Family values and traditions are a key “spice” of Benvenuti wines. They produce wines where the varietal reflects all the wealth of vineyards, situated on a series of specific micro-locations. Their terraced vineyards and white marl and marlstone soil, with special a microclimate, the grapes here give character to the wine which is reflected in pronounced minerality, freshness and full expression of all varieties features. These qualities are present in all our wines, from basic and served Malvazija, through fresh and harmonious Teran, to intense and pleasant acid rich sweet wine.